Having missed a couple of weeks of cyclo cross I was keen to make it to the London League round at Reed Court Farm. My knee had been playing up in the last couple of weeks so I'd had to rest up. Since it had been slowly getting better, and I was missing cycling I decided to go with Fred to the race on the Kent farm. My knee was twinging as I left the house, and at one point I thought that it might be better for me to just spectate. But given the miserable weather conditions I was loathe to standing around in the pouring rain for an hour. When the weather is wet and dismal you tend to forget about those facts while racing. As a spectator, an hour can seem like alot longer. So I paid my entry fee and joined the runners and riders. This was the third time I was racing at Reed Court Farm - and still I hadn't quite got the hang of getting to that venue in good time. Well, at least this year I had 5 minutes to spare when I reached the start line ! The commissaire blew his whistle promptly at 1.30pm to set us off on our 60-minute mud-fest in the damp. As I wasn't actually sitting on my bike when everyone set off, I immediately found myself at a 10 metre disadvantage to the herd ! This didn't phase me as I'd been in this position countless times. Anyway, given that I'd had no warm up and my leg was twinging, I preferred to ease my legs in gradually rather than rev them up too quickly. Soon I gained ground on the riders at the back and managed to pass a few people, including Nicola from Kingston Wheelers. I must thank her for pointing out the various dismount points ahead of me like the big log and the steps to run up. These are the trip hazards for those, like me who try and race around in the mizzle without having recc'd the course. I passed a few guys, then managed to catch more women racers - Sarah from San Fairy Ann, and Abi from London Phoenix, who put up a bit of a fight to not let me pass her. A couple of years ago she would have mown me down in this race. This time I managed to hang in there and make my move past her. All this catching and passing people during the race actually gave me confidence. I was even beginning to enjoy myself. Not even the mud in my eyes or the grit in my teeth were going to spoil this party. In previous years this course had been a real arduous task in the dry conditions. It had been an energy sapping boneshaker ride trudging across ploughed furrows. Today it was an energy sapping ride squelching and sliding around mud tracks. But the mud is what makes it fun ! I found that losing a few seconds at the start to let air out of my tyres had paid off. I felt comfortable taking the slippery corners at speed, and I didn't fall down at all - something that wasn't the case for my next opponent in the race - Helen from Crawley Wheelers. She took a tumble on the 180 degree corner while I was on her wheel. I would have preferred to overtake her while she was upright and riding, rather than while she was face down in the mud. And thus I romped and slid around the course at speed, battling to catch whoever I could. I wasn't sure where I was among the women because I didn't know how many of us there were. Just when I was hazarding that I might be third, behind Nicky Hughes (Folkactiv) and Claire Beaumont (London Dynamo), I heard a female voice shout - "on your right" ! I moved out of the way to find myself being lapped by schoolgirl Corrine Hall (Team Corridori). And didn't she just make me feel like I was standing still ! So in the end, I finished 4th out of the eight women. I was pleased with my ride, considering I hadn't ridden much in the preceding fortnight. With a snotty muddy face I didn't look very photogenic, but at least I'd put in a solid ride. 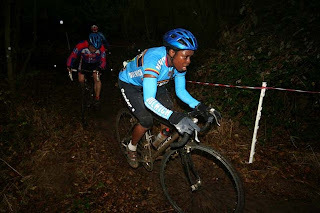 My next goal should be to do cyclo cross Italian style - with full make-up on, not a hair out of place, while still looking immaculate as I cross the finish line for a podium spot !